A San Diego nursing home whistleblower claims she was ordered to close cases prematurely by supervisors at the state's Department of Health. Rose Espiritu will tell her story in court on Tuesday when her civil lawsuit goes to trial. Espiritu's lawsuit also alleges discrimination after she claims three of her supervisors discouraged her from seeking medical treatment for the severe pain in her wrists caused by carpal tunnel syndrome. Espiritu claims in court documents that her managers harassed her, denied her reasonable accommodations and retaliated against her for filing a workers' compensation claim. The lawsuit alleges supervisors urged Espiritu to close cases by "providing false or inaccurate information in investigative files." 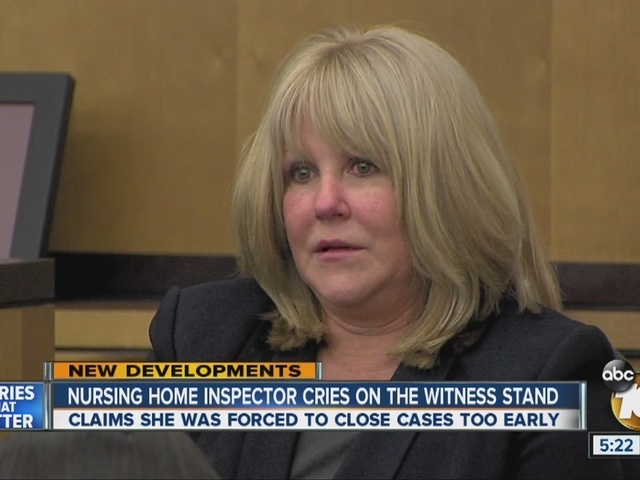 One of those files involved serious allegations of nursing home conduct that resulted in the death of a patient. Espiritu claims in the lawsuit that she signed the documents under duress, and she later contacted the Centers for Medicare and Medicaid to report the illegal conduct. "That really raises red flags because it shows they are not really taking these complaints seriously," said Marian Hollingsworth, a patient safety advocate. "This could be your mother, your grandfather … they could be in serious jeopardy in a nursing home or a hospital, and this complaint is not investigated. It could be life-threatening." Hollingsworth said her own father died in a nursing home as the result of several errors on the part of his caregivers. Hollingsworth cited a 2014 audit that revealed a statewide backlog of more than 11,000 complaints, many of them involving patients who were in immediate jeopardy. "To have a whistleblower come forward and actually say this is really going on here in this office, that is really big information that could really affect people's lives here in town," Hollingsworth added. Court documents filed on behalf of the California Department of Health claim Espiritu's case is merely a workers' compensation issue and that she can't claim retaliation because there's no proof she ever reported her supervisors to the federal government.